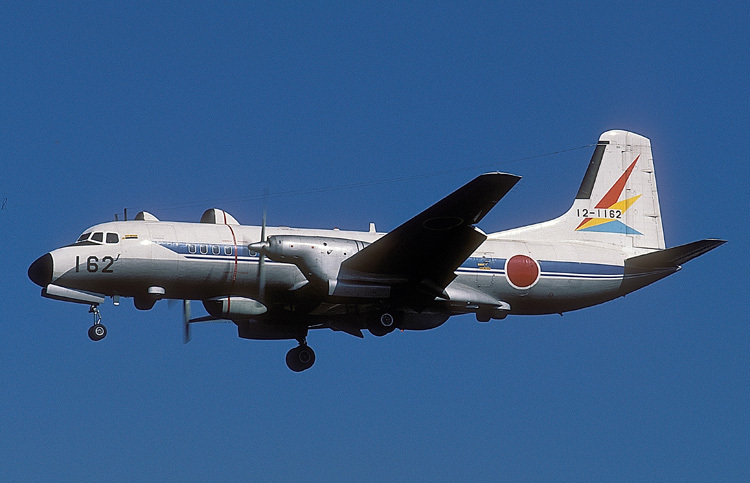 The YS-11 was Japan's first and so-far only domestically designed airliner. The Nihon Aircraft Manufacturing Company received quite a bit of assistance from Hawker Siddeley during the design phase, as the similarity of the YS-11's engine nacelles to those of the contemporary HS-748 clearly shows. The YS-11, however, is a much larger aircraft, able to seat 64 passengers compared to the 748's 40. It saw considerable success both domestically and abroad, serving with no fewer that 72 different airlines and the militaries of Japan, Greece, Columbia and the Philippines. 4 remain in service with the JASDF. Anyone familiar with Hasegawa's airliner kits will find themselves on familiar ground with this kit. Hasegawa's hard grey plastic makes up most of the model, with 4 vinyl washers (2 spare) to retain the propellers and 12 resin antennas which are needed to build the EW version in this boxing. There is one clear sprue holding the small windscreen. Modellers wishing to do a civil scheme will rejoice that no conversion work will be necessary. The fuselage is two halves from nose to tail. No cabin windows are provided; they're on the decal sheet. There is a rudimentary cockpit with 2 seats moulded onto the rear bulkhead, but little else will be seen through the very small cockpit windows. Hasegawa's solution for nose weight is 3 small pieces of white metal which are trapped between the cockpit bulkhead and a U-shaped retainer. Once in place, they provide sufficient weight to keep the model balanced properly. The resin antenna lumps and bumps are to be glued into place after the fuselage is closed up. The instructions clearly show where each is to be positioned. The wings come in two pieces each from root to tip. Hasegawa has played their usual trick of moulding part of the flaps and ailerons into the upper half, and putting the seam line in the middle of the flaps rather than at the hinge line. This leads to unnecessary filling and sanding, and requires the modeller to take extra care to ensure a good fit. Why they couldn't move the seam a couple of milimetres is beyond me. The tailplanes are one piece each with the elevators moulded in neutral. They could be displaced but this is rare in parked aircraft. The engines come in two halves each with a portion of the wing leading edge on either side. There is a fit issue with the completed nacelles being slightly too narrow to fit comfortably into the recess moulded in the wing; they will need some shimming with plastic card. Once shimmed, there are no other fit problems, and the complex shape of the nacelles is captured well. The props may be left off until after painting and push fitted into the nacelles. Each propeller blade has 2 decals for the leading edge deicing strips and tip warning stripes. They ought to be trimmed very closely to the edges of the printed colour or else they'll be very difficult to place onto the tiny, narrow propeller blades. Placing all 16 will be an exercise in patience. The landing gear struts and wheels are very delicate and to scale. There are no brake lines, but they'll look okay without them. The wheel well doors are overly thick, but nicely shaped. I don't compare models to drawings or published measurements. When assembled it will look like a YS-11. This boxing has markings for two otherwise identical aircraft from the JASDF's ADC Headquarters and Electronic Warfare Squadron, based at Iruma Air Base. Aircraft 12-1162 or 12-1163 may be modelled, but only the numbers change. The scheme is an older scheme of white over aluminium paint with a blue cheatline which differs from the current toned-down greys. It would have been nice to have that marking option available. Modellers wishing to portray other aircraft from the squadron are cautioned that they are equipped with GE T-64 engines with 3 blade propellers and larger nacelles. It may be possible to rob the nacelles from an LS Orion and the props from an A-model C-130A kit. 12-1162 captured on final approach for landing. Highs: The only YS-11 in this scale. Very easy construction. Lows: Only one paint scheme. Verdict: This will be an enjoyable model. Nice-but I wish it was in 1/72! I know about the Bandai kit, but it's quite hard to find, and I believe the reissue only has the tinted windows for the military version. I want to be able to build the civil version.